Some of my favorite recipes are the products of happy accidents. This homemade breakfast sausage is one of them. Here's how it went down: I was planning on making potsticker paleo meatballs, but when I went to the fridge, I realized I'd used up all the cilantro earlier in the week. Whoops. I also realized I bought double the amount of thyme I needed for another recipe. Whoops again. Anyhoo, that's where I started — 2 lbs of ground pork and a ton of fresh thyme. What resulted is one of the best recipes on this whole blog. For real. It's quite good. Stir all the non-meat ingredients together in a large bowl. Then mix everything with the ground pork until thoroughly and evenly seasoned. Fry up in a large skillet (you shouldn't need much, if any, additional fat). You want the sausage to brown nicely, and a crowded pan hinders that. It's a fantastic paleo breakfast sausage, but you could use it in plenty of non-breakfasty recipes too. I love sausage, so this blog is filled with them (Sausage Stuffed Portobello Mushrooms, Thanksgiving-In-Your-Mouth, Kale-Sausage Soup, etc.). I even used some of these leftovers in a Thai red curry and it was amazing. Fry it up with apples and onions and serve on top of a Dijon and lemon-dressed salad. Make a hash with sausage, sweet potatoes and veggies, topped with a fried egg. 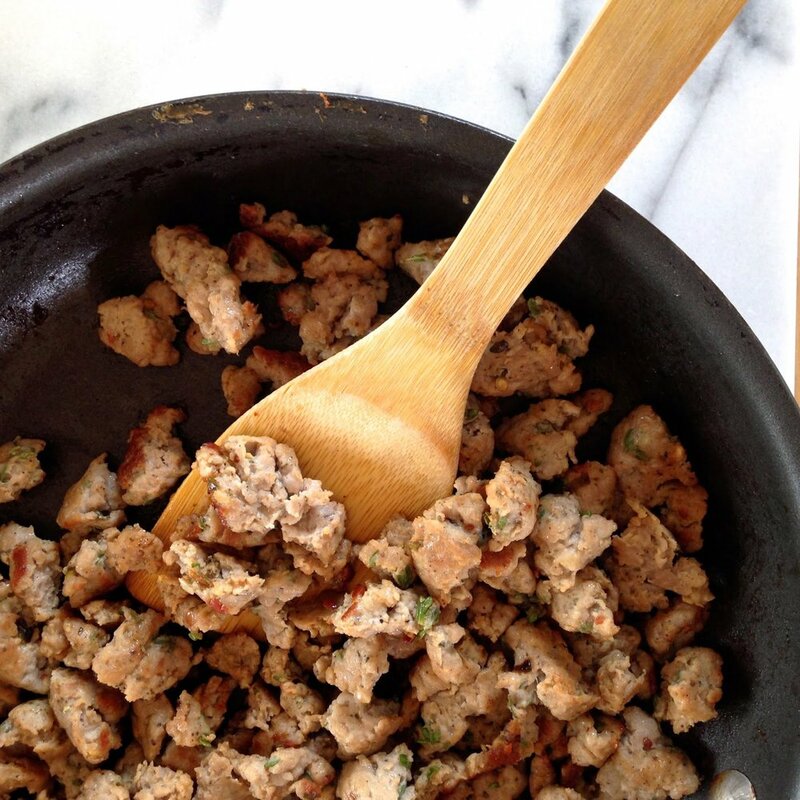 Try the Bomb Paleo Biscuits and Gravy, using this very sausage! Try making this into meatballs and serve with mashed cauliflower or potatoes.